When the pipe and connector are stuck, push and pull the connector to release it. Then pull the connector from the pipe. (b) Unlock the fuel sender gage and slide it to remove. (a) Using a screwdriver with the its wrapped in tape, disconnect the 4 snap-claws from the claw holes and remove the fuel suction plate. (b) Using a small screwdriver with the its wrapped in tape, disconnect the 2 snap-claws from the claw holes and pull out the fuel pump. (b) Using a screwdriver with the its wrapped in tape, disconnect the snap-claw from the claw hole and pull out the fuel tube joint. (c) Apply a light coat of gasoline or spindle oil to the O-ring again, and install the fuel pump to the fuel suction plate. (c) Align the keyway of the fuel suction tube support with the key of the fuel suction tube. (e) Align the triangle mark on new fuel pump gauge retainer with the "S" mark on the fuel tank while pushing down the fuel suction tube, attach the fuel pump gauge retainer. (f) Rotate the fuel pump gage retainer by hand, then tighten it one complete turn and half using SST. 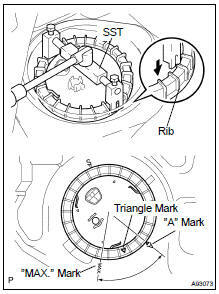 Triangle mark on the fuel pump gauge retainer must be positioned between "A" and "MAX." indications on the fuel tank.